Wine up your weekend at this Wine Village in Nashik, where you can go stomp on grapes and get woozy. 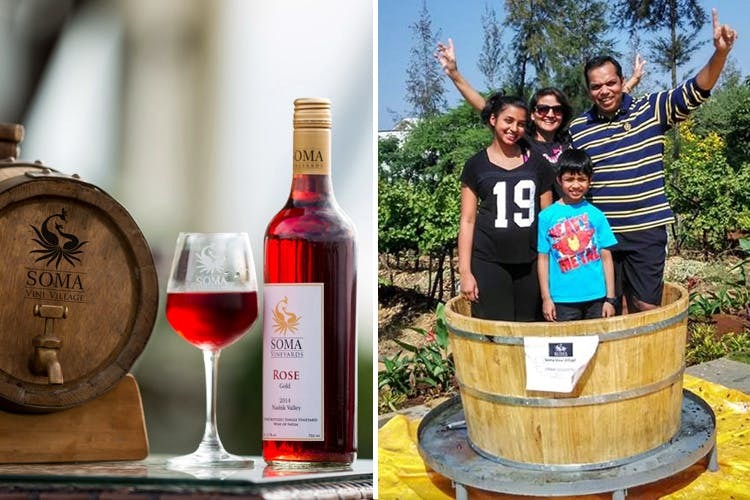 Make your trip to Nashik and visit the Soma Wine Village – where you can go traipse around the vineyard, all the whilst sipping wine. You can take a tour around the vineyard irrespective whether you're staying at the resort or not. Order some food, and you'll be given an array of wines to taste (more inquiry can be made at the restaurant. Sometimes they're running exciting offers). But what steals the cake for us is their grape stomping activity which is when they let you step inside barrels of grapes and stomp on them. The grape stomping session is for INR 1,600 per bucket for 4 people, and time permitted is around 20 minutes – after which you will probably want to get out anyway. With picturesque surroundings like theirs, you can also head out for a photography tour, some adventurous activities, stargazing, and local sightseeing. And if you like the place, hold your ground and check into one of their nice and neat rooms that start at INR 3,300. We suggest you leave your apprehensions behind, let your feet get messy, and get a little giddy. Clink!